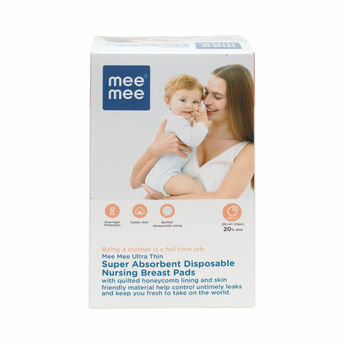 Mee Mee Premium Disposable Breast Pads now come with improved absorbency for better comfort and longer protection. To provide nursing mothers with protection against breast milk leakage, the breast pads are hypoallergenic and dermatologically tested that can lock in moisture, thus ensuring maximum dryness. Available in a pack of 20 pieces + 4 complimentary pieces. Conforms to International standards of Safety & Hygiene. Designed for nursing mothers as well as mothers in later stages of pregnancy. Protects against sudden leaks & milk stains and keeps mother dry and comfortable always. Anti-slip outer layer ensures a snug fit into any brassiere. Very discreet to use and contoured shape molds itself to your natural curves. Not visible after you're fully dressed.